Annie Attwater (Taraji P. Henson) is the voice of Operation Breakthrough, helping voice concerns of the African-American citizens of Durham, North Carolina in 1971. She has earned the nickname “Roughhouse Annie” because of her confrontations with the Durham city council. One of Annie’s biggest critics is C.P. Ellis (Sam Rockwell). C.P. is the president of Durham’s chapter of the Ku Klux Klan. When he’s not running his gas station, he is recruiting members for the Klan and training them. When one of the schools for the black community burns down, the city council rules the kids must finish out the school year in the portions of the building that weren’t damaged by the fire. Bill Riddick (Babou Cesay) is called in as a mediator to help them come to a solution that is acceptable for both sides. Riddick is known for his charrettes, bringing both sides of an argument together until they reach an agreement. Riddick selects Annie and C.P. as his chairs to lead the conversations. A panel of 12 citizens, including Annie and C.P. will vote on the resolutions at the end of the charrette. City council will then have to abide by the decisions of the charrette. What most people don’t realize is that Councilman Carvie Oldham (Bruce McGill) isn’t afraid to use C.P.’s influence and members of his group to help influence the panel. As the charrette is drawing to a close and getting ready for a vote, the stakes are extremely high and tensions are growing. Based on the true story of Annie Attwater and C.P. Ellis, The Best of Enemies tells the unlikely, yet all too familiar story of one of the ugliest periods of our history. 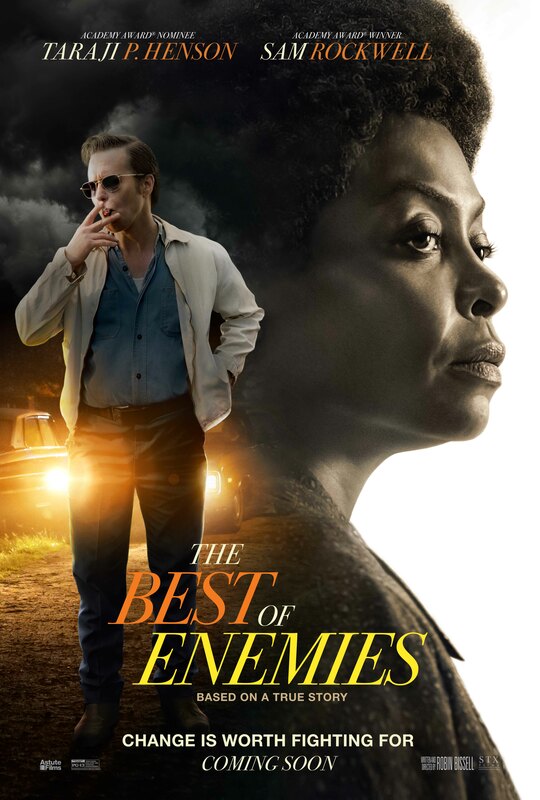 As you would expect, Taraji P. Henson and Sam Rockwell give stellar performances. Henson shows the determination and frustration experienced by Attwater and so many who fought for integration and equal treatment. Her resolve is matched only by her love for her family and her community. Rockwell plays a man who is a product of his environment and takes his beliefs as far as he can. His belief system is obviously flawed, but deep down he just wants to do what he thinks is right for his family. It is in his caring for his family that he is finally able to grow and see beyond what he has believed his entire life. The rest of the cast fills in excellently in their parts, portraying both sides of a town at war with itself, neither wanting to bend to the desires of the other. The story is difficult to watch at times, primarily because it is based on actual events that took place in our country, and continue to happen to some extent. It is heartbreaking and infuriating at the same time. That said, to see the growth of some of the characters shows that it is something that is possible to overcome. In that aspect, the film gives a bit of hope. The Best of Enemies is a well-crafted film that tells an important story from our history. Everything from the sets to the performances by the actors make for an authentic retelling. Unfortunately, this authenticity comes with some extremely strong language and situations that may make some uncomfortable. However, this discomfort is precisely what is needed to help us learn from these stories. Whether you see it in the theater or wait for a rental, this is a film you shouldn’t miss.